Though smoking marijuana is the most common form of achieving the effects of the drug, eating, drinking and even bathing in the product is gaining more popularity among users. 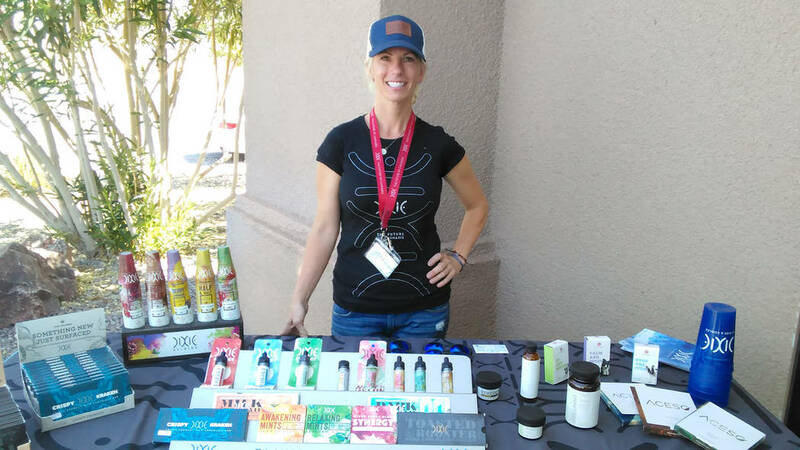 During the first day of recreational marijuana sales in Pahrump on July 1, officials at The Grove dispensary along East Basin Avenue introduced a vendor of marijuana edibles. Dixie Brands Elixirs and Edibles began roughly seven years ago in Colorado. Executive Sales Representative K.C. Thompson set up shop at the facility in Pahrump when legal sales of recreational marijuana began earlier this month. Regarding the CBD classification, Thompson said the variety of available pain-relieving products are numerous, for both people and even their pets. Years ago, Thompson said she had a much different opinion of marijuana, be it the THC variety of the CBD’s. Lee Thompson, no relation, to K.C., grew up in the late 1960’s during the Vietnam era. Thompson was one of the hundreds of visitors to The Grove when recreational marijuana sales began this month. Though Thompson maintains a positive view of the legal marijuana industries in the western U.S., he does not use the drug. K.C. Thompson, meanwhile, noted that at present, the only facilities offering medical or recreational marijuana are located in the western United States. Those states are Nevada, Colorado, California, Arizona and Washington state.